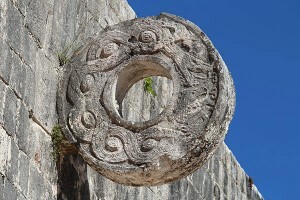 Zero Sum Game is a riff on the Mayan Ball hoop at Chichen-Itza in Mexico. If you haven’t been, add it to your bucket list. It’s spectacular. The ball hoop was part of a very high stakes, low-scoring basketball game played by the Mayans…part sport, part ceremony, part human sacrifice. 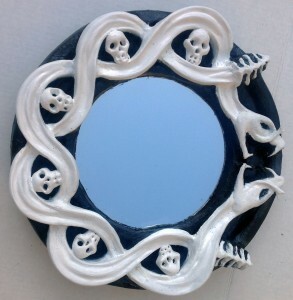 The entwined snakes represent a universal struggle of evenly matched forces. Not all matches ended in death, but many on that court probably did. To the winner went all the glory (and perhaps the loser’s head). Along with written language of glyphs and a nifty calendar, the Mayans are known for the invention of the number “zero”. Hence the title of the work.